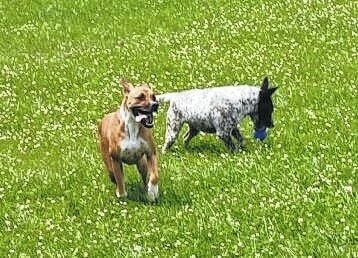 Two dogs, Dave (Brown) and Tressea May (Black and White) play outside at the Humane Society of Preble County. The dogs are two of around 65 adult dogs currently living at the Humane Society of Preble County. Currently the charity faces a food crisis, as the source of up to 80 percent of the food donated is no longer available. The shelter goes through around 50 pounds of dog food a day, not including puppy chow. EATON —The Humane Society of Preble County is searching for a new source of dog food after recently being informed the source of 80percent of the food they receive will no longer be available to them. According to Leslie Renner, chairman of the board for the Human Society of Preble County, one day the source was there, the next it was gone. Renner explained the source of food from Richmond accounted for about 80 percent of the food used for the shelter’s some 65 adult dogs who go through about 50 pounds of adult food a day. They will also use about five pounds of puppy chow a day depending on the number puppies at the shelter, which she said can vary every day. Because of the food shortage, the Humane Society of Preble County is looking to hold a food drive to help bring food into the charity for the first time. Renner also said the food drive has not started, as they plan to use the food they currently have and will discuss the best way to hold the food drive internally before going to the public for assistance — but they always accept donations. Renner explained the shelter does not need a certain brand or kind of food they just need a lot of food. Renner also explained despite many people’s misconceptions, the Humane Society of Preble County has no affiliation with the county or any other government affiliation and operates as a charity organization dependent on donations. She continued by explaining because of that, the shelter relies heavily not only on donations but also volunteers to help around the shelter doing things like cleaning and basic maintenance on the building. The few employees they do have dedicate much of their time to the animals. Renner said they do work closely with the Dog Warden of Preble County to try to make sure animals do not have to be “put down” and will take in animals from the pound. However, she said since they take in so many animals they cannot always take in animals when people come in with strays or unwanted pets, due to lack of space. The Humane Society of Preble County is still a primary adoption agency locally, and Renner said their main goal is to find a good fit for both the person and animals. Renner said for those interested in volunteering time at the Humane Society Pet Center, they need to be at least 16 years old. Any time or money that is donated is always appreciated, especially during a time of need for the shelter.